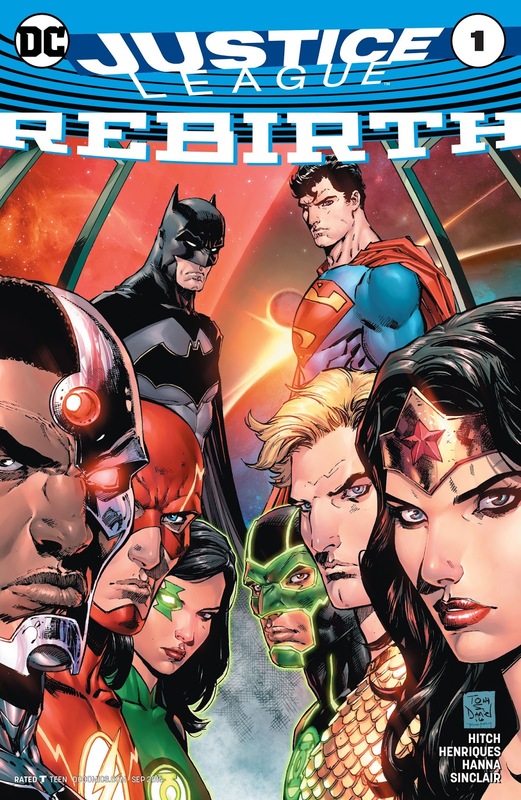 I've looked at the comic that started the whole Rebirth thing for DC Comics, and several of the Rebirth restarts for various characters. Now I'm looking at the restart of one of my favorite comic book franchises, Justice League Rebirth. 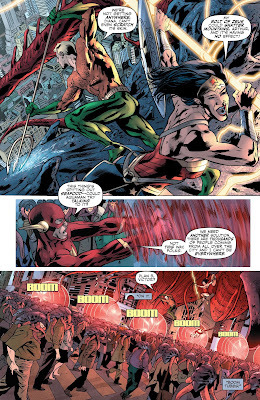 The monumental task of relaunching DC's major superhero team goes to Bryan Hitch, handling both writing and illustrating duties. Hitch has worked on the team before and is probably best known, at least to me, as the artist who brought Marvel Comics Ultimates - a super-realistic version of their Avengers - to life. I admired the attempt, disliked the story and the characters, but dug the art. 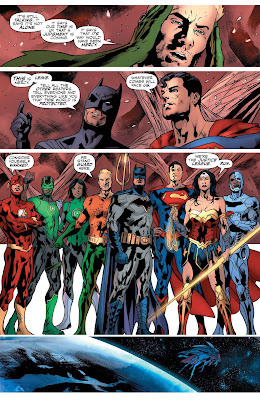 I still like Hitch, somewhat (he draws an ugly Wonder Woman, sorry, but it's how it hits me), but this is not his best work, or perhaps his style is not right for the Justice League. I think it might be the latter, at least on the visuals. His Flash also bothers me, never looking like the Flash, but more like just some guy in a Flash suit. Bryan Hitch is aware of the new continuity, and the old continuity. He's better than some of DC's guiding editors in this instance. I loved how he wove in the new/old Superman and the two semi-new Green Lanterns into the story to aid the remaining five Leaguers - Batman, Wonder Woman, Flash, Aquaman, and Cyborg - against an oncoming alien threat. At first, the giant alien monster attacking the unnamed city seems almost Lovecraftian, then kinda downgrades to a cheap Starro knock-off. Either way, the Justice League's triumph is straight out of "Doctor Who," specifically that first Matt Smith episode, "The Eleventh Hour," when he tasks the Atraxi to run, and tells everyone that Earth is defended. Despite some problems, I liked this issue, not as much as some other Rebirth books, but enough to give it a chance if I come across it again.